Hilton Hotels is one of the biggest hotel chains in the U.S., and one of the best known brands in the industry. They have over 500 locations, scattered around the globe, and they remain as one of the most highly sought after locations for travelers because of their reliability and reputation. A career with Hilton is a good way to break into the industry with a steady job with a lot of opportunities for the future. With this page, we hope to give those considering a career here a brief overview of the information that they will need to know to jumpstart their new profession. Hilton offers a lot of entry positions, as well as a lot of career paths for those that are looking for a professional career. Entry positions include guest service agents, bellpersons, and room attendants. The guest service position involves checking guests in and out of their rooms, promoting and recommending hotel services, processing guest payments for their stay and other services, as well as explaining any fees and giving directions. This position starts out at around $8.75, but it is not unheard of to have experienced agents make more than $15 per hour. Bellpersons are responsible for helping guests find their way to their room, and assisting with luggage when required. This position starts at minimum wage, but there is a lot of potential for earning tips, especially when their service is above average and in a higher luxury area. Room attendants are the housekeepers. They go into the bedrooms at off peak hours, tidy up, make sure that all of the amenities are stocked up, and any other basic housekeeping tasks that might be required. This position pays around $9 to $10 per hour, with potential for tips, as well. Many Hilton Hotels locations have servers, and the pay here is typical to a bellperson. It starts at around minimum wage, with tips playing a heavy role in how much you will earn. Management positions are in high demand with this company. These start out at around $45,000 to $55,000 a year in salary, and move upward as you gain experience and more responsibilities. These positions require experience or a collegiate degree with the appropriate background in your degree. Thanks to their brand name power, Hilton has one of the strongest line of hotels in the U.S., and this has established them at the forefront of the industry. They are a large company, offering great pay and plenty of upward mobility for their employees. If you are interested in the hotel industry, this is one of the best places that you can start. They have locations all over, making a Hilton job a reality for most people that seriously pursue one. 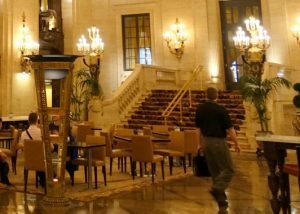 Hilton offers decent benefits to their employees, as well, putting them at the front of the business in this respect, too. They offer 401(k) matching, life, health, and disability insurance, hotel discounts for employees and immediate family, as well as corporate discounts through their affiliates. This company has high expectations for their staff. Employees are expected to be age 18 or older, have good backgrounds, and be dedicated, motivated workers. Having a high school diploma or a GED is helpful, but not necessary. You don’t need to have a background in the hotel industry to secure a job either, as most positions are entry level, but having experience with customer service can be helpful. This is a job that revolves around helping others, so having a friendly demeanor is also a must for employees. The people that are most encouraged to apply are those that love helping others, are hard workers, and are looking for a long term and stable career. This is an industry where anyone that shows signs of being a good worker can succeed, but being able to take initiative is what separates the best employees. Hilton Hotels employees are expected to put the customer first. This means going out of their way to make sure that guest needs are not just met, but exceedingly surpassed. Employees should be hard workers, dedicated, and very pleasant and polite. This is a career where there is a lot of interaction with customers, and you are, in a way, the face of the company for their visits. Having great customer service skills is a good trait, although it is often something that people learn in more detail as they progress in their job. If you are interested in applying for a Hilton position, the first step is filling out the application. This is something that needs to be filled out online. If you go to the company website, scroll down to the bottom of the page, and click the “Careers” link. This will take you to a section where you can search through job openings near you, and anywhere else you might choose. You can search by location, or by job title. Once you create a profile, you may begin the application. Set aside about 30 to 45 minutes to do this, although most people will be able to finish it on the shorter side of this. This will give you a better chance of thinking your answers through in more detail and ensure accuracy. Remember that this is a large company, and they get hundreds of applications. Once you apply, show some patience and wait about two weeks before following up. It can be helpful to follow up in person at the location you applied to, but if you go, make sure that you are not going during their busy hours. This will not only help you to have a better chance of speaking to a hiring manager directly, but it will also ensure that you are not bugging them when they’re busy. For example, it’s best to wait until after the daily checkouts have taken place, but before people start coming in for the night. Just be sure that you look and act the part that you are applying for. This is a customer service job, and it will be expected that you are a professional in all manners.